Building on a tradition of collaboration, The Rockwell Museum and Corning Museum of Glass are pleased to once again team up and host a contemporary artist in Corning. This year, we welcome sculptor and fiber artist Crystal Gregory to the Amphitheater Hot Shop. Gregory will work collaboratively with the Hot Glass team of The Corning Museum of Glass as part of the Guest Artist Series to experiment with new ideas and processes to further enhance her mixed media works. The collaboration comes as The Rockwell introduces an inaugural new exhibition series: Antigravity! Each year, the museum will commission one emerging artist to create a site-specific installation for The Rockwell’s rotunda entryway. The 2018 inaugural installation will feature Gregory's sculptural work. Known for experimenting with materials not often found together, Gregory exemplifies this years’ Art + Science program theme at The Rockwell. 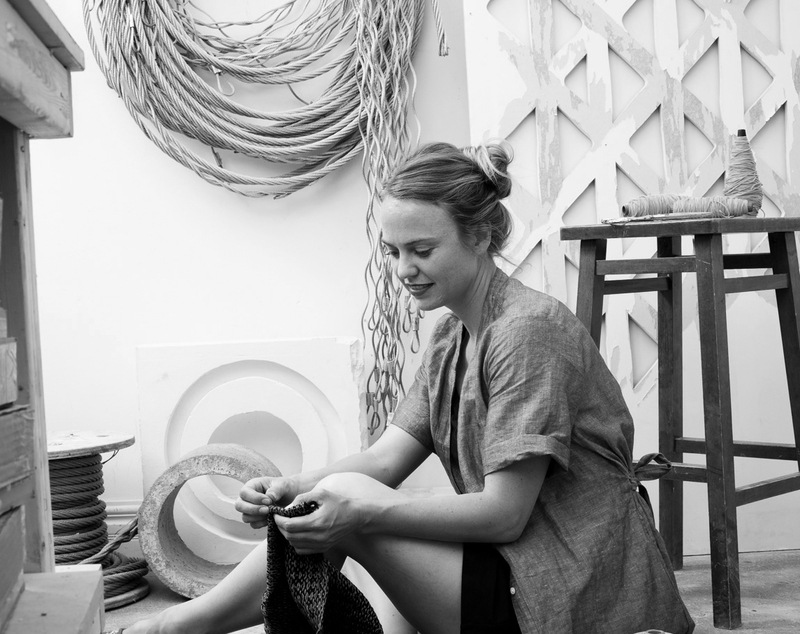 Her work may combine hand-woven fabrics and molten pewter, or lace and concrete. Gregory uses woven lace structures as the foundation of her work, paying particular attention to negative space and light. For this installation, the artist looks to Josef Albers’ color theory, The Interaction of Color, for inspiration. Crystal Gregory is a sculptor whose work investigates textile structure through a variety of materials. Gregory earned her BFA from the University of Oregon and was granted a Full Merit Scholarship to attend The School of the Art Institute of Chicago where she earned her MFA from the Fiber and Material Studies Department. In 2013, she was awarded highest honors with The Leonore Annenberg Fellowship for the Performing and Visual Arts. With this grant, she moved to Amsterdam where she took a role as Artist-In-Residence at The Gerrit Rietveld Academie of Art. Her work has been exhibited in galleries and museums nationally including Devotion/Destruction: Craft Inheritance at Dorsky Gallery Curatorial Projects, Load Bearing: The Art of Construction at The Hunterdon Art Museum and Crossover at Black and White Project Space and has been reviewed in publications such as Surface Design Journal and Art Critical. Gregory is the Assistant Professor in Fiber at the School of Arts and Visual Studies at the University of Kentucky. Gregory splits her time between Lexington, Ky., and Brooklyn, N.Y., and currently shows with Tatyana Okshteyn at Black & White Gallery/Project Space in Brooklyn, as well as Momentum Gallery, N.C.